Teddy Boy / Teddy Boy Blues (テディーボーイ・ブルース) - Development - SMS Power! For some states, bit 7 of the same byte is used to distinguish a change of state (bit 7 reset) from a continuation of the current state (bit 7 set). Scores in Teddy Boy are always multiples of 10. Internally, therefore, the game stores values of score / 10 and simply adds a trailing zero for display. These values are stored as groups of three bytes in (little-endian) BCD format. The highest score attainable is thus 9,999,990. Player 1's score value is stored in RAM at address $c010 and player 2's at address $c013. The value for the top score is stored at $c00a. There are 35 ways to gain points during play. Each of these achievements will increase the player's score by a certain amount of points. These amounts are stored (in the same format as the scores) in a lookup table at ROM address $355f. 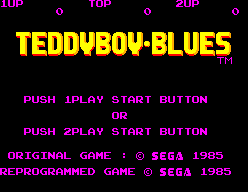 Teddy Boy uses a single palette for most gameplay, although the colours at indices $00 and $10 are often overwritten in order to change the background. Different palettes are used for the title screen and for the bonus game. 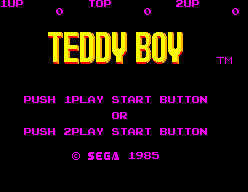 The title screen palette data can be found in the Teddy Boy ROM at $0907. The bonus game palette data is at $3986. In the Teddy Boy ROM, the corresponding data is at $0950. The copyright information on the title screen has been simplified, involving the removal of one data block and modification of another. Other than this, the only change to the string data is to update each block's ROM address to point to the correct characters. After resetting the game, enter the Options Screen. Ensure that the Continue option is unavailable and select a 2 player game. Then, enable the Level Select and immediately start the game without changing the round. Player 1 will face round 1, as expected, but player 2's game will be heavily corrupted. This bug arises from the implementation of the level select. When the level select is entered, the Continue option is (internally) forced to "Yes" and when the round is changed, the number is written to RAM as though that round was reached by both players during the previous game. If the round is never changed, therefore, entering the level select is simply equivalent to enabling the Continue option. When there is a game to continue, this can give surprising results  but is mostly harmless. However, when there is no game to continue, the memory locations which hold the round reached during the previous game have the value zero on entering the level select. Code to initialize the values is present, but it only does so for player 1. Player 2 can thus "continue" their game from the invalid round 0. If no buttons are pressed on the title screen, a demo of round 1 will begin. Teddy Boy's movements during the demo are driven by simulated input - the data for this is in "TransBot" format and is located at $403c-$4288 in the Teddy Boy ROM. Each time the demo plays, it uses the same input data. Variety arises from randomness in the movement of monsters. Internally, the game refers to the monster types using the numbers 1 to 7, as above, but with one exception. When describing monsters within dice, the number 8 is also used. Once released, these monsters become type 7 - the use of 7 or 8 only changes how the release occurs. Specifically, type 7 monsters are released in a group (the same as type 6), while type 8 monsters (and types 1 to 5) are released individually. The round layout data is stored at $68dc - $7bb7 in the Teddy Boy ROM. Two tables of pointers into this area exist at $0efd - $0f60 and $0f61 - $0fc4. Each table contains one entry for each round from 1 to 50. The first table gives the address of the round layout itself and the second gives the address of a zero-terminated list of the monster types (1 - 7) used in the round. The background colour for each round is stored in a third table, at $0fc5 - $0ff6. The function at $0b77 - $0bb0 performs the initial decompression, yielding the blocks and the top tile of each wall. The code at $0bb1 - $0be3 then expands the walls downwards. The code at $0be4 - $0c61 decompresses the die data for the round. The functions at $0c62 - $0c79 and $0c82 - $0cbc, using a lookup table at $0c7a - $0c81, add sides to the blocks and walls to create the oblique projection. The code at $0cbd - $0ced, $0cfc - $0d36 and $0d57 - $0d67, using a lookup table at $0cee - $0cfb, adds the tile indices for the face of each die. The function at $0c82 - $0cbc is reused, along with a lookup table at $0d37 - $0d3a, to add sides to the dice. After calling these functions, the code at $0e68 - $0e78 converts the tile indices in RAM to name table entries in VRAM. The bonus game layout is stored in the same way, at $3c96 - $3d09. It is decompressed as above by the code at $38ff - $390a (except that the die data is decompressed by calling $0bf6 rather than $0be4). A call is made to $3d0a to randomize the contents of the dice before the code at $390e - $391e performs the conversion of tile indices to name table entries. An update function at $4d3a. This is called on every IRQ (once per frame), except when the game is paused. A reset function at $51be, which is called only when the reset button is pressed. The main game code communicates with the engine through a trigger at $c080: writing a sound track number to this address causes the track to begin playing. The data for each sound track begins with a header: one byte giving the number of channels, followed by nine bytes for each. These are used to initialize the first 9 RAM bytes per channel. $096a - $0980 "PUSH 1PLAY START BUTTON"
$0983 - $0999 "PUSH 2PLAY START BUTTON"
$342d - $3445 "TOP ROUND REMAIN"
$344c - $345d "PLAYER 1 GAME OVER"
$345e - $3464 "TIME UP"
$3465 - $346e "TIME BONUS"
$346f - $3476 "0 POINTS"
$347c - $3485 "BONUS GAME"
$3486 - $3492 "SPECIAL BONUS"
$3493 - $349f "PERFECT BONUS"
$34b0 - $34ca "BUT DON'T TOUCH THE DENDEN!" $442f - $4435 "YES NO"
$53ec - $541b 1bpp Tiles: !'TM. ^ If the previous game involved two players who reached different rounds, they will continue from those rounds rather than from the single round shown on the level select screen (that reached by player 1). ^ The function at $01a9 - $01c4 is unused. ^ The last fade-in colour overlaps with the first entry of the title screen palette. ^ a b This string uses a non-ASCII character set, so appears to contain arbitrary punctuation characters when viewed in a hex editor. ^ This area contains code, except for a block of data at $0ebf - $0edc. ^ This area contains code, except for blocks of data at $1854 - $1863 and $1909 - $1944. ^ The functions at $1e72 - $1e7a and $1e7b - $1e83 are unused. ^ This area contains code, except for blocks of data at $2016 - $201f, $2119 - $2122, $224c - $224f and $23b5 - $23bc. ^ This area contains code, except for a block of data at $27c7 - $2816. ^ This area contains code, except for blocks of data at $2b55 - $2b6c, $2c70 - $2c7b and $2dbc - $2dc0. ^ This area contains code, except for a block of data at $3ee0 - $3f00. ^ This area contains code, except for blocks of data at $4e89 - $4ea4 and $4f90 - $4f97. ^ The code at $4ff6 - $4ff8 is unused. ^ The functions at $51dd - $51e1 and $51e2 - $51e6 are unused. ^ This area contains 7 groups of 9 indices. The first group is all zero, representing a missing die. The following groups represent dice showing 1 through 6. ^ 16 bytes are reserved for each die. The bonus game contains 20 dice - standard rounds have a maximum of 6. ^ A backup copy of this information is made when the player loses a life. Data need only be copied for at most 6 dice, as it is impossible to lose a life in the bonus round.